Delong and Krugman make "math error", while falsely accusing Greg Mankiw of making math error! Delong and Krugman are now claiming that the Furman ratio -- defined by Furman himself to be the ratio of wage gains from a corporate-income tax cut to a "static" revenue loss defined as rate change times corporate income -- is equal to one, rather than being greater than one (namely, equal to 1/(1-t)) as Greg Mankiw showed. They go on to claim that Mankiw made this supposed mistake as a political ploy. But it is they who are making a mistake, in "Dem's favor" (purely accidental, I'm sure). 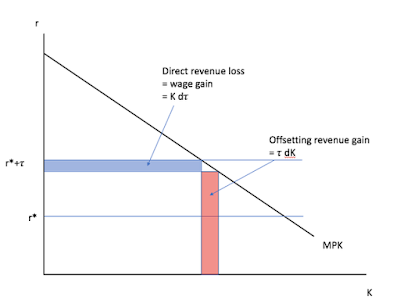 Specifically, Krugman says that his blue rectangle is the wage gain from a small tax cut. I agree. But it is wrong to equate that to Furman's static revenue loss, because that loss is strictly smaller than his rectangle. As Jason Furman confirms, Delong makes the same mistake algebraically by equating Furman's static revenue loss to his term "(a)" plus term "(b)" when in fact the loss is just his term "(a)". Krugman's blue rectangle, and DeLong's (a)+(b), cannot be Furman's static revenue loss, because they incorporate an equilibrium price change in the calculation of the corporate-income tax base. The static revenue loss from the corporate-income tax must, by Furman's definition of "static," hold corporate income constant. [Unlike DeLong, Krugman does not actually use the word "static." He says "direct" -- it is possible that he understands Furman's static and Krugman's direct to be different, and just failed to indicate the distinction to his readers. It's fine if he prefers his blue rectangle to Furman's "static" revenue loss, but remember that by all accounts the blue rectangle is about $400b/year -- close to CEA's estimate of the wage gain. In other words, when you change to the blue-rectangle definition of "static" you not only reduce the theoretical Furman ratio by a factor of (1-t), you also increase the static revenue number by the same factor. The CEA's $4k per family is fixed. even when those cuts are scaled so that both have the same effects on revenue and the surplus of all parties. That is why I use actual revenue loss. The ratio between the two "static" concepts is the (1-t) factor that has Delong and Krugman so confused. You may also be interested in a previous instance when, with important public-policy issues at stake, Krugman failed to appreciate what supply and demand really says and neglected to admit his error. What does Summers 1981 say about the long-run incidence of the corporate-income tax? I already explained that in two different ways: cutting the tax increases wages more than it reduces tax revenue. Contrary to Summer's claim, this result is not "unprecedented in analyses of tax incidence" rather it is one of the most ubiquitous results in analyses of tax incidence. Notice that Summers' response this morning fails to claim that I am wrong about the LONG-RUN incidence in HIS MODEL (It should already be obvious that I am not wrong -- my early post already provided the algebraic analysis of, and precise citation to, the relevant equation from his paper). Perhaps Summers really means that he thinks that the long-run incidence in HIS MODEL can be safely ignored. If that's what he means, he should say it directly and then I will respond. He claims that "Mulligan also fails to recognize that a corporate rate cut benefits capital and hurts labor outside the corporate sector because it draws capital out of the noncorporate sector, raising its marginal productivity and reducing that of labor." [emphasis added] But of course I did -- it is my item (C) -- and pointed readers to one of Summers supply-side-economics papers on that very subject. He claims that Greg and I overestimate the effect of Trump's plan on the incentive to invest (see his "a cut in the corporate tax rate from 35 to 20 percent in the presence of expensing of substantial or total investment has very little impact on the incentive to invest"). But Greg and I are looking at INFINITESIMAL changes -- it doesn't get any smaller than that! Regarding Summers other points this morning, not specific to Summers 1981, I had already anticipated them. Jason Furman and Larry Summers weighed in this week about the quantitative amount that labor can benefit from a capital-income tax cut. It soon became clear that they had failed to carefully use price theory in coming to their conclusions. Furman and now Krugman (update: and now Summers) are admitting that simple supply and demand vividly contradicts what they said/say about taxes, but assert that the world is more complicated. I agree. But they are dead wrong to further assert, without evidence (and I suspect without thinking), that adding complications will overturn the simple supply and demand conclusion or at least weaken the contradiction contained in their original proclamations. can give quantitative answers. Greg Mankiw writes "I must confess that I am amazed at how simply this [quantitative formula] turns out. In particular, I do not have much intuition for why, for example, the answer does not depend on the production function." Supply and demand can answer his question, without any algebra. can deal with complexities, such as "imperfect competition." The simple supply and demand model assumes perfect competition, but that assumption can be and has been modified. Guess what?! Making that modification shows that even the simply supply and demand model, let alone the proclamations of Furman-Summers-Krugman, understates the wage impact of capital-income taxation. can deal with complexities, such as debt finance. Having uneven taxation of different types of capital tends to reduce the denominator of the Furman ratio more than it reduces the numerator. i.e., Furman still has it even more backwards than I thought (update: Summers too). shows you how to process the economic data. 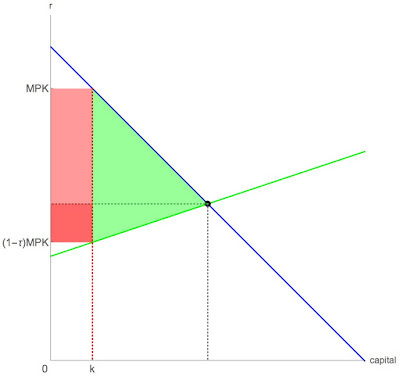 Furman and Krugman make evidence-free proclamations about the elasticity of capital supply. Supply and demand shows what economic data is needed to measure that elasticity (spoiler: it's not complicated, and shows a very high elasticity). I will post on these individually next week (week of Oct 30). In the meantime, you may be interested in a previous instance when, with important public-policy issues at stake, Krugman failed to appreciate what supply and demand really says. Update: 2 hours later Summers posted a reply that reiterates the "it's complicated," "monopoly profits," and "debt finance" excuses for ignoring what the simple model says. See my points 2 and 3 above. He also hopes that you forget that he referred to CEA's result -- which is generally in agreement with the simple supply and demand model -- as "unprecedented in analyses of tax incidence." Regarding Summers' other replies, see here. Furman’s first sentence has the economics of investment completely backwards. 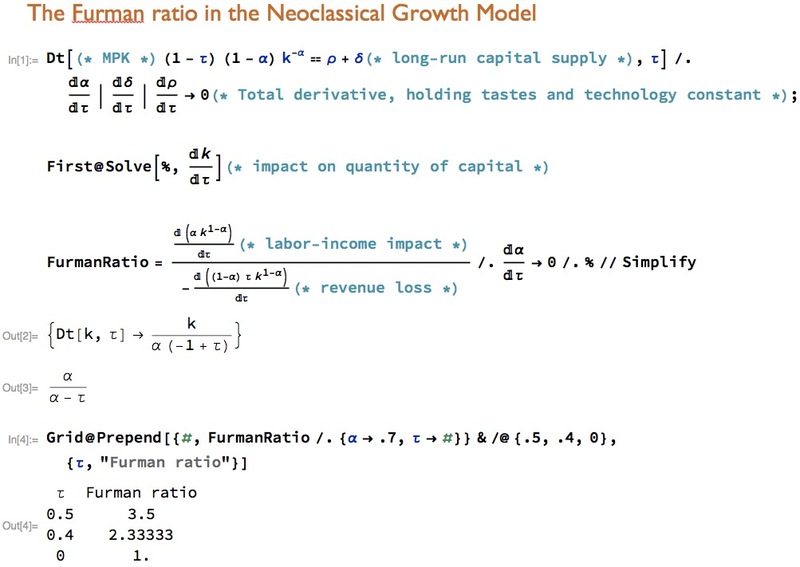 I will point to academic papers in a minute, but they can be understood with capital supply and capital demand, as shown below. The red area (R) is the revenue from a capital income tax. The red and green areas (R + G) are the losses from that tax suffered by owners of the factors of production, combined for capital and all other factors. The revenue is a LOWER BOUND on the factor owners' loss. In the long run, all of the factor owners' loss from a capital income tax is a loss to labor (the area below the horizontal dashed line is negligible; see A below). Therefore, in the long run, capital-income tax revenue is a LOWER BOUND on labor’s loss. Furman and Summers have it backwards. They don't seem to understand that the wage gains from a cut come not only from the Treasury but also the economic waste created by the corporate tax. (A) Why would labor bear all of the burden in the long run? Well, ask Larry Summers back when he used to be an academic studying these matters. His 1981 Brookings paper, which even today is an article commonly used by me and others to teach this in graduate school, says so on page 81 equation (7). The left-hand-side of that equation is a perfectly elastic long-run supply of capital: it says that the supply curve in my picture is, in the long run, properly drawn as horizontal. See also Lucas (1990, p. 303, equation 4.3). (B) OK, the long-run Furman ratio must be greater than 100%, but how big is it? If we (i) begin, as is today’s reality, with a high tax rate, and (ii) conservatively assume that the only channel for benefits is a higher capital stock (more on that below), then 250% is about right for cuts to somewhat lower rates. Using a Cobb-Douglas aggregate production function with labor share 0.7, and a 50% capital-income tax rate (combining corporate, property, and the capital components of the personal income tax), I get a Furman ratio of 350%. With a 40% tax rate instead, the Furman ratio is 233% (algebra here; these refer to modest tax-rate reductions -- not going all of the way to zero). If the current CEA said 250%, then it got Furman's ratio much closer than Furman did, who puts it less than 100%. Note that Summers now calls the 250% "unprecedented in analyses of tax incidence," yet I am getting it from his own paper about how the corporate-income tax works (see esp. p. 95)! Update on (C): Greg Mankiw points out still more labor benefits not shown in the picture. His source -- you guessed it! -- Larry Summers. (update: Summers' reply now revokes academic work more generally. He also wants you to forget that he said CEA's Furman-ratio result to be "unprecedented in analyses of tax incidence." Moreover, he digs his hole deeper with his critiques of the simple model. I.e., President Trump should be thanking Summers for unwittingly strengthening the case for corporate tax reform. Citizens in a democracy can criticize their government and its laws without government reprisal. But what happens when your government is not only the enforcer of law, but also your boss? Your boss, of course, is less willing to have you in his employ if you are speaking out against him. I spoke to a young woman who was shortly due to sit examinations to become a judge. She thought there was a good chance that her role in assisting the local [Catalan] referendum process would destroy her chances of becoming a judge, and said that one of her fellow students was too scared to even vote for the same reason. Of course a judge is an occupation naturally in the public sector, but the point is: the more occupations that are pushed from private to public sector (or any huge employer -- but what private organization employs as many as government? ), the more people who are unwilling to speak out against harmful government policies. The economic analysis of voting primarily takes voting as instrumental: like a bank account, a vote is supposed to be nothing more than a means to an end. A few of us have argued against this: e.g., Geoffrey Brennan, Bryan Caplan, and recently Becker and Mulligan, but that is a small minority. The polling station workers thought that if they had computers with older technology they may be able to connect to a wifi system [the Spanish government was blocking polling stations' internet access] ... we all started clapping – it had worked! They were connected. One man inside excitedly ran to inform the others... “I’m going to be the first to vote!” he yelled excitedly, to laughter. The two elderly women and a handful of others inside took up their ballot papers and voted. Then the gates opened and the first round of people walked through. Everyone was cheering and applauding jubilantly ...the faces of those who came through were still calm and resolute but some became tearful after they voted. It was a really moving moment, and it’s hard to accurately put it in words. The best way I can describe it to say there was an overwhelming sense of dignity about both the moment and the people. That voting is to many people not merely a means to an end is better understood by Catalan separatists than the Spanish government.